The US Amateur Team East is held every year in Parsippany, NJ. It’s the most well-attended annual team tournament in the country with ~1200 players showing up in 278 teams this year, and by far dwarfing other similar regional tournaments across the country! Here’s an excerpt taken from a related USCF article regarding the main rule: “The four-player teams (some come with alternates as well) must average below 2200 and play in board-order.” USCF coverage of the event can be viewed here and here. The Cake Came out Early 🙂 . 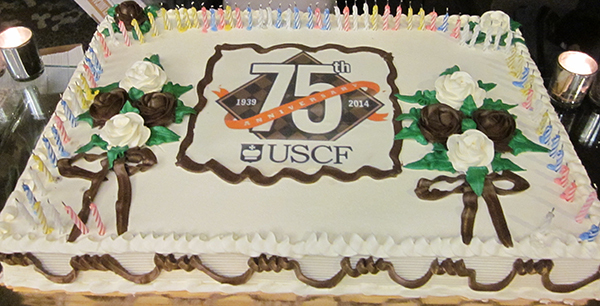 The Tournament coincided with the 75th anniversary celebration of USCF, and everyone was treated to a sumptuous cake and coffee. Happy B’day USCF! Our team captain was Grant Xu playing on Board 2. He was the mastermind behind the compiling of a high average rating. 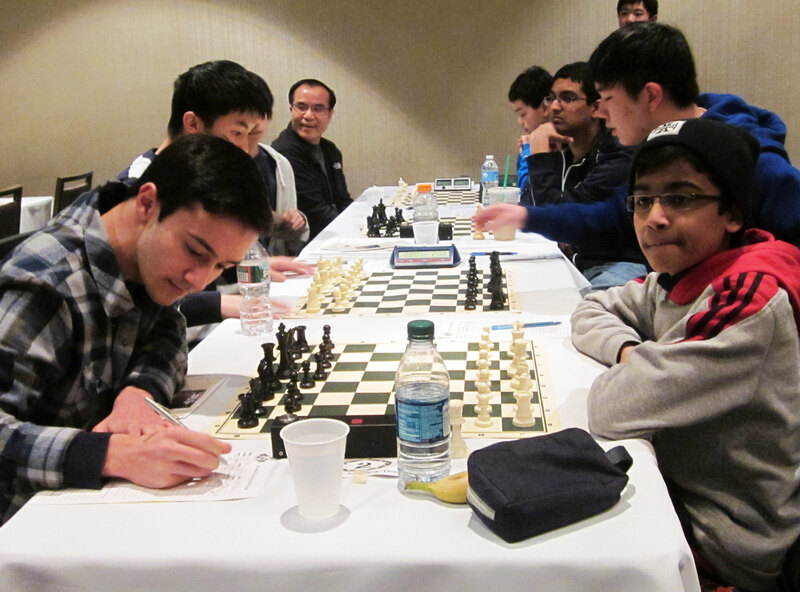 On Board 3 was Siddharth Arun, and on Board 4 was Jason Tang. So this was our team of School children from Grades 10, 11, 9 and 6, respectively. I knew Grant, but had never met my other teammates. All three of them were from MA, while I was a local NJ player. I was a late addition to the team – a roster change. Less than two weeks before the tournament Grant approached me through this blog for a fill-in, since the original Board 1 could no longer play. We played Hamilton Chess Club in the next round. 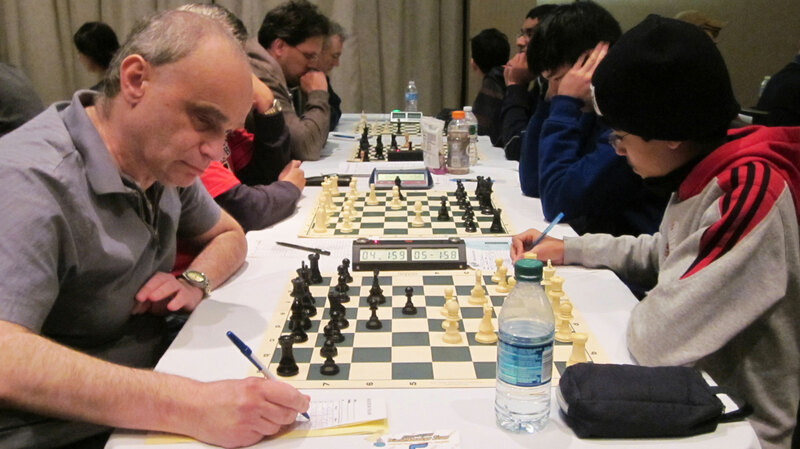 I was playing White against FM Boris Privman (2197 FIDE). The game was extremely long and enervating, and lasted for 6 hours into the night. But in the end I prevailed. It wasn’t the best game from my side at all, as I could have ended the game much earlier. Our Board 3 and Board 4 Won as well, while our Board 2 Drew. So we won the match 3.5-0.5. So halfway into the tournament, we were tied for the lead with 3-0. I liked the way I had played my 3rd round , but still wasn’t satisfied with my overall play. In the 4th round, we played the team Nobody 🙂 , and I was White against Robert M Perez, a talented junior on Board 1. I made an inaccuracy early on, and was slightly worse after 20 moves. Being worse as White after 20 moves is hardly ideal. But Chess is not all about attacking and winning; you have to be good at defending worse positions as well. I was able to do just that, and was expecting Robert to go for a Drawn rook endgame, when he suddenly took a daring risk trying to Win. When the smoke cleared and we reached 40 moves, the first time control, I emerged with what was a probably winning Queen Endgame. Nonetheless, I decided to Draw since that would end the match in our favor 2.5, irrespective of the outcome for the remaining game on Board 2. Final score was 2.5 to 1.5. Making such mistakes early on was not acceptable. I needed to rectify that immediately, considering that I was going to play a stronger player on the final day. 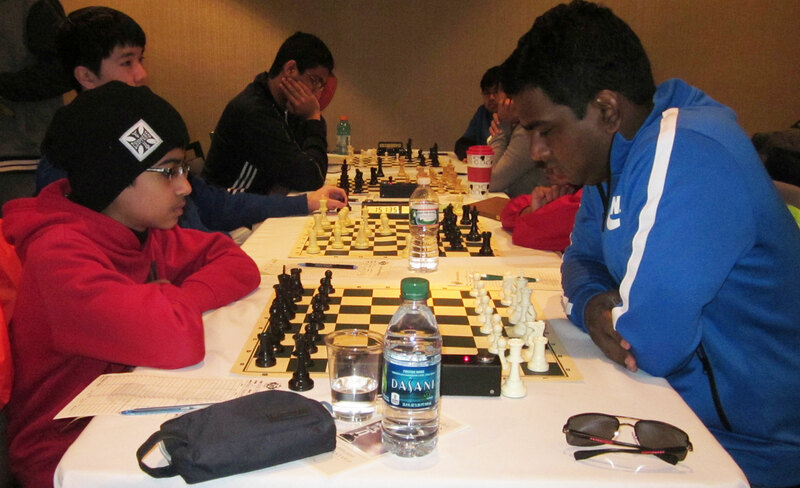 In Round 5, we were paired against Chess Kings & Queens 1 (GM Magesh’s Chess Academy). They’d the same 2197 team rating average as us. 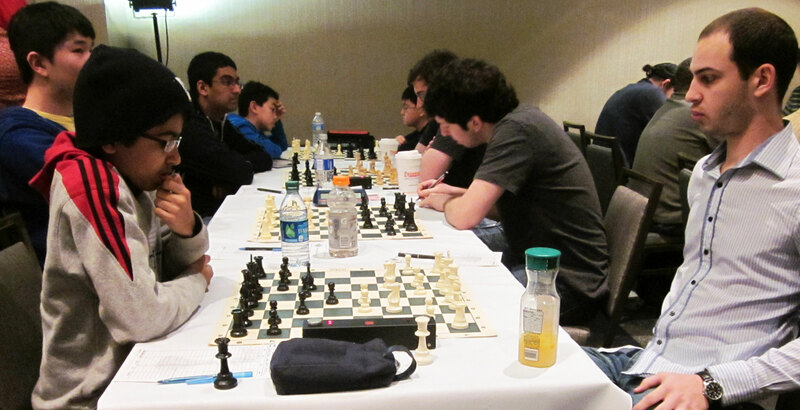 On Board 1 I was playing none other than GM Magesh Panchanathan (2557 FIDE). In an exchange g3 Gruenfeld, GM Magesh decided to sharpen things up by playing 10.e4 !?. So I was up a Pawn a few moves later, but my pieces weren’t that developed. Some inaccuracies from Magesh’s side allowed me to consolidate, and I started to play for a Win. But a really boneheaded 22nd move vaporized all the promising possibilities, and it was I who was now fighting for a Draw. The critical line was 22.Bxb5, Bxa8, Rxa8, after which I thought my c2 Knight would be trapped; but it manages to wiggle out in all lines. So in a span of 3 moves, I went from being a Pawn up and playing for a Win, to being a Pawn down and fighting for a Draw – Dang 🙂 . Magesh was down to only 2 minutes however, and we were still 14 moves away from the time control. He played very accurately despite the time pressure, up until his 40th move. At that point he played 40.Be2 allowing me to equalize immediately. Things were looking like an easy Draw now, when suddenly I blundered with 53.Ra5 ??. Ke5 kept things in balance, since after g4 I have Ra4 !, which is what I missed. I was now losing by force, and was getting ready to resign, since I expected Magesh to play 60.Rb8. But Magesh made the reflex 60.Rh6 ? ?, and after Rxb5!, I’m able to draw due to a stalemate trick if he takes on h5 ! We played a 2 vs 1 for some moves, which is an easy Draw, but I was down to my final minute. On move 80, when I was down to only 26 seconds, the classy GM Magesh offered me a Draw, displaying great sportsmanship for what was technically a Drawn game. That’s a real chess player right there. You rock Magesh! Like two gladiators, we fought to the end trying our best to Win, but eventually agreed to a Draw after ~6 1/2 hours. The final team score was 3 to 1, in our favor. Now going into the final round, there were only 2 teams at a full 5-0. It was us, What does the GM Say?…, and last year’s winner Princeton A. Due to my long game earlier, I had about 10 minutes to eat, relax and get ready for this crucial and decisive round. 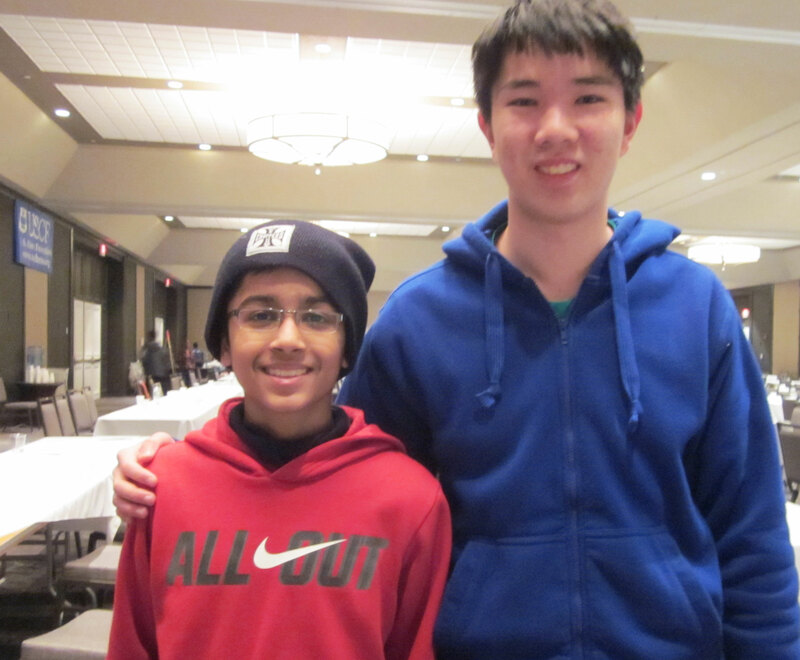 I was to face Princeton University’s Board 1 Michael Lee (2388 FIDE), and I had a double-black. Princeton A had a team average of about 2197, so we were evenly matched. Michael chose an extremely strange opening line, deviating from his usual 1.c4. After the center closed up, we began our flank operations with Michael advancing on the Kingside, while I tried opening things up on the Queenside. An erroneous recapture by him on move 21, gave me an advantage which I didn’t relinquish for the rest of the game. I missed ways to Win quicker which was disheartening since they weren’t so difficult. But I still played accurately without giving the Princeton University star any chance to make amends. I was still pretty happy to have gone 5/6 on Board 1 in the tournament against good opposition, despite making quite a few mistakes. 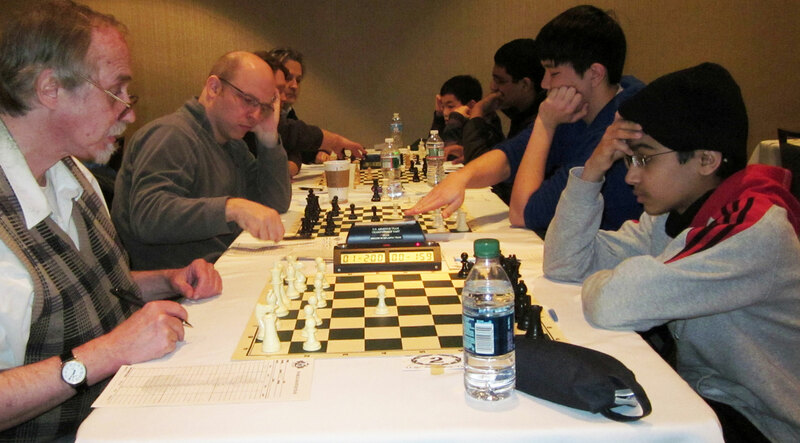 But winning my game was not enough, On Board 2, Grant Xu beat the other experienced Princeton player Andrew Ng. Unfortunately for us, winning on top 2 boards didn’t Win us the tournament. This time our bottom two boards lost to Princeton University A. So the match score was 2-2, a tie. Princeton A and us, What does the GM say?, had tied for 1st place at 5.5/6 points each in the US Amateur Championship East – 2014. We were joined by a veteran team On the Rohde Again, which had won their last round. So this was a 3-way tie for first place. On tie break, which added points from all matches, Princeton University A was awarded the title, and we were given the 2nd rank. That was sad, since I felt that our team had a tougher path to tying for 1st as we beat Princeton’s strong top two Boards while they beat our lower two boards. I would have preferred a US Championship or US Chess League style tie-break – a Blitz match, possibly starting at Board 1 or Board 4, and moving on to next player, till the final winner is left. Ah well, such is life 🙂 . We took comfort that last year Champions Princeton University couldn’t beat us and that we’d almost turned the tables. I congratulate Princeton A on their win, and their historic back-to-back achievement. Maybe we get to play for the National title, in case Princeton A is unable show up 🙂 . Perhaps one day I’ll go play alongside these smart players at their historic University since they’re not far from home. Overall it was a fun experience, and I’m glad that we tied for 1st, and came 2nd on tiebreak, in what was an extremely strong team tournament. On all boards, our team members came through when it counted most. Great job Grant, Sid and Jason! I’d like to thank and appreciate the effort of the organizers to flawlessly host a tournament of this magnitude. 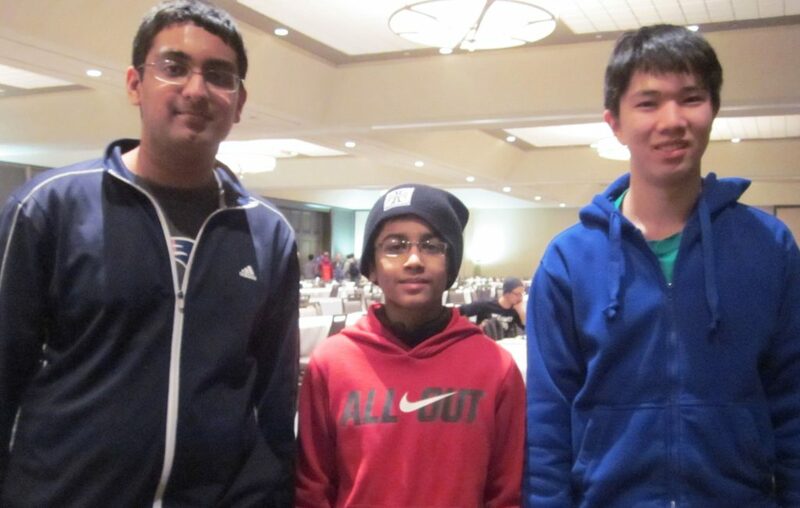 Good tournament, Akshat! You guys deserved to win! I think you could have played on without much risk against Perez, but I understand why you took the draw. I look forward to beating you on ICC, your friend, Jefferey.